Besides The Advancement Of Various Technologies I.E. Social Networking, Messaging Services And Other Options, Email Still Maintains Its Legacy Of Formal Communication. It Has Become An Essential Part Of Businesses Whether From Client To Company, Within Employees Or Among Organizations. It Remains The Core Means Of Professional Communication. Effective Spam Filtration: Spam Are Unwanted Mails And A Great Time Taker. A Good Email Service Must Have Efficacious Spam Filters To Detect And Throw Out Spams. Reliable: Should Be Reliable, Must Cater Your Needs Everywhere On The Go And Every Time. Security: Major Factor, In The Current Scenario Where Hacks Are Growing Easily, It Must Have Two Way Or More Authentication And Advanced Security Options. Storage: An Adequate Amount Of Storage Must Be Provided So That You Did Not Run Out Of Space With Efficient Backup Means. Interface: Interactive Design And UI Keeps User Attracted Towards The Service And Increases The Willingness To Work With. It Maintains The Ease Of Access Without Turning Into A Turmoil. Tools Integration: Addition Of Various Tools Enhances Productivity And Hassle Free Operation. Various People Needs Various Tools Like Calenders, Reminders And Other Suites To Perform Jobs. One Of The Best And Free Email Service Provider Owned By Google LLC. It Is Majorly Used Across The Globe For Personal And Business Communication. A Recent Report States That Gmail Is Used By More Than A Billion People Throughout The World. Gmail Comes With The Productive G-Suite : A Collaborative Platform Of All Google Apps With Numerous Pricings. Gmail, Released In 2004 Has Emerged As A Market Leader In Offering Free Mailing Services. Ultimately Gmail Is A Combination Of High End Security, Multiple Features, Multiple Platforms, Fantastic Design For Both Business And User Fabricated With Powerful Tools And A Blend Of Perfection. Last But Not The Least: A Reputation From Google Corp. Packed With Amazing Features, Gmail Offers Top Notch Quality Of Mailing Services. Primarly Known As Hotmail, Outlook Is Its New Reinvented And Updated Form. Developed By Microsoft Corp. Outlook Offers Free, Mailing Services And Has Emerged As A Potential Rival For Gmail. Sabeer Bhatia & Jack Smith Launched Hotmail. It Became One Of The First Free Email Service To Access Online Inboxes. In 2013 The Later Was Reinvented To Outlook But The Old Domain Named “@Hotmail” Remained In Continuation. Its Offers Excellent Services Letting You To Add All Your Social Media And Email Accounts In Same Place. Like Others, Premium Options Are Available But There Is A Free Mail Option. It Can Handle Large Attachments As Compared To Others And Offers 15 GB Of Space For Free Customers. Office 365 & 365 Home Customers Get 50gb Of Space. It Has More Tight Integration With Twitter, Linkedin & Facebook. One Of Amazing Feature Of Outlook Is Sign In With Temporary Password I.E. Without Using Original Password. You Can Recover Deleted Mails, Use HTML & CSS To Enrich Your Mails, Block Emails Of Particular Address, Find Space Hogging Mails And Of Course, Outlook Is Fast. Outlook Comes With Integration Of Variety Of Microsoft Services Like Skype, Office, Onedrive, Bing, Msn & Flow .It Works Exceptionally To Filter Spams And Scans All Mails For Viruses & Blocks Mails From Known Phishers. Yahoo Also Offers Free Mail Services And Has Been In Existence Since 1997.It Provides Four Different Plans I.E. Basic, Plus And Ad Free And Other Business Plans Also. It Has A User Base Of Approx. 285 Million Making It A Third Largest E Mail Provider Across The Globe. Setting Up A Yahoo Mail Account Is Hassle Free And You Need To Require Only A Valid Mobile Number. Free Version Allows 1 Tb Of Inbox Storage And Offers 25 MB Of Space Available For Attachments Like Other Service Providers. Yahoo Likewise Outlook Also Blocks Messages From Phishers And Let You To Block Messages From Specific Senders Which Can Be Seen Nowhere, Not In Any Folder Unlike Others. It Has Highly Customized Interface Which Can Be Turned Into Colors For Fun And More Personalized. Offers Tools Like Calender So That You Can Easily Integrate Your Tasks And Reminders. You Can Have Access To Yahoo Messenger Which Makes Your Chat Easy. It Is One Of The Newest Mail Service Came Into Existence In 2008. In A Short Span It Has Developed Popularity Among Popular Mailing Engines Like Google , Yahoo , Outlook Etc. The Mailing Service Has A User Base Of More Than 5 Millions And Provides Solid Packages For Personal And Professional Use. It Is Generally Marketed To Small Organizations Or Businesses But Also Offers Free Mailing Services. It Is Typically Business Centric Because It Comes In A Productivity Suite Named As Zoho Suite. Zoho Suite Has Similar Tools Like Google Suite Which Provides Word Processing , File And Docs And Other Tools.It Comes In A Package To Build User Bases, Manage Expenditures And Projects . Instant Chat Feature Enables You To Connect You To Family & Friends In A Click. It Is Quite Easy To Set Up Free Account Like Other Providers And Mobile Number Is Verified For New Account With Valid Details. The Interface Is Easy To Use And Include Various Buttons On Toolbars. It Has Basic Functions Which Can Be Clearly Seen And Other Icons Are Available For Zoho Tools Like Calender, List, Contacts On The Left. It Offers Unlimited Storage For Inbox Mails So You Never Run Out Of Space. Attachments Can Be Uploaded Upto 20MB Like Other Rivals And One Can Preview Them Also. Spammers Addresses Have To Be Manually Entered To Block Or Redirect To Spam Or Trash. It Also Supports Auto Reply Feature And Conversation View. One Major Drawback Is That You Cannot Import Contacts Directly From Social Media Accounts. The Contacts Can Be Imported From Other Providers Like Gmail, Yahoo Etc. AOL Mail Is A Free Web-Based Email Service Provided By AOL, A Division Of Verizon Communications. Verizon Acquired AOL In 2015 And Decided To Move All Its User Base To It In 2017. AOL ( America Online) Stands As Good Competitor For Other Four In The List. It Has A Long History As A Mailing And Still Continues To Provide Free Mail. Setting Account Is Same Like Others To Access Its Services. It Doesn’t Support Variety Of Tools But The Later Have Assist In Powerful Functioning. A Mail Alert Is “ You Have Got A Mail” Is Shown When New Mail Comes. Interactive Interface Maintains Simplicity And All Composition Tools Are Crisp And Clear. Multiple Attachments With A Limit Of 25 MB As Of Others Is Also Applicable Here. AOL Uploads Files More Faster Than Others Do, Acting As A Great Advantage. 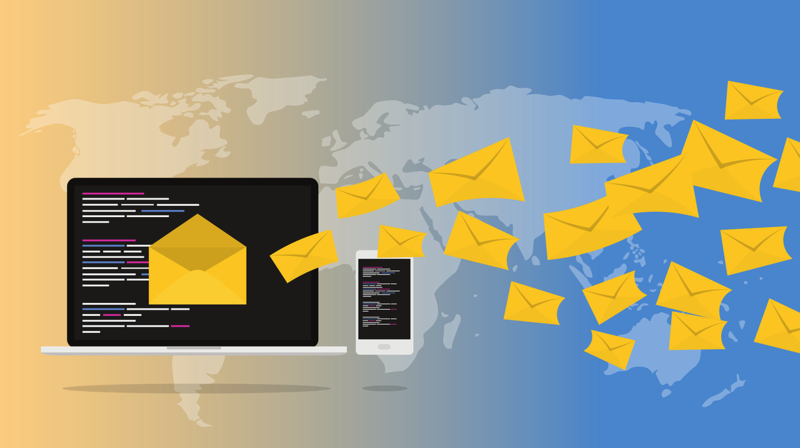 Packed With Effective Spam Filters And Designed For Multiple Platforms AOL Mail Is A Combination Of Faster Messaging And Simplicity. Since It Lacks A Feature For Alias Accounts, Translator For Different Languages And Social Media Contacts Imports, Very Few Features Are Available Which Slows Down It In The Competition And Popularity.